The Ninth Grade Service Learning Incubator is underway! After forming small peer groups, students have begun exploring social and environmental issues they'd like to address. Through design thinking, students are tasked with finding an injustice in their own community and researching the issue to find a way to alleviate the problem. Students will talk with experts on October 1 and learn about systemic issues in the community to find out the best way to address their chosen cause during the first half of the year. They will be visiting 13 different local partners, including Special Olympics, the LGBTQ center and Agua Hedionda, to conduct interviews and find out more about issues in our community. 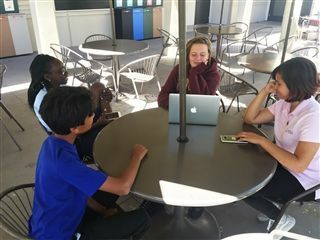 During the second half, students will either continue with their idea or decide to join an existing service learning group.